 The National Association of Distinguished Professionals(NADP). They are headquartered in New York. They recognize the top people from different professional careers, who they believe, upon nominations from their Executive Board, and then after an extensive review by a Selection Committee, has been an extraordinary leader and role model in their chosen field. 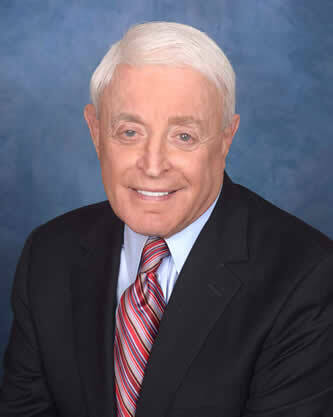 “We selected Attorney Corky Goldstein for his outstanding Legal career in Pennsylvania, and his tremendous accomplishments in the practice of Law and for The Legal System”. When experience counts, when time and personal attention matter, there is only one name that comes to mind. 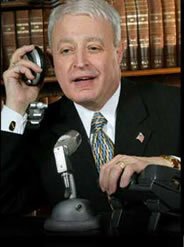 Corky Goldstein, Esquire is a serious attorney and a Central Pennsylvania area household name for decades. You always need a respected member of the legal establishment on your side when involved in any legal matter. Corky doing a legal radio call-in show. 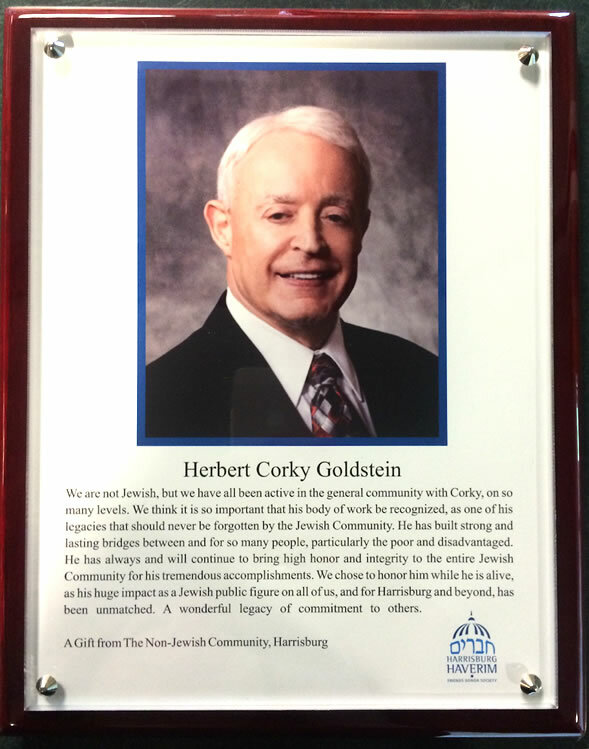 Corky received the very distinguished honor of being placed in The Jewish Federation of Greater Harrisburg’s, distinguished “Legacy Hall of Fame”. This prestigious Award is for his numerous civic and community activities and his outstanding Legal career. 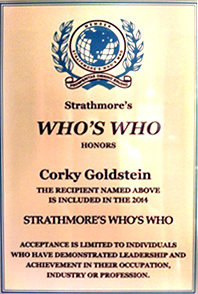 What is so special is that Corky’s nomination was made by 18 non-Jewish major community leaders who also made a large donation in his honor. They wanted to have Corky see in his lifetime how important and appreciated his tremendous efforts have been for Greater Harrisburg (which includes Dauphin and Cumberland counties). 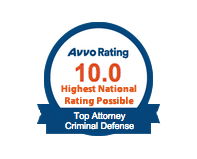 defense, divorce, custody law, and private consults on all legal and political matters with 40 plus years of practice. Co-Founder and General Counsel of Fresh Health Innovations, Inc., a company that deals with prevention and conditioning information for athletes, trainers, coaches, and parents. He also serves as the Vice Chair of the Harrisburg Parking Authority. Extensive expertise in legal and public affairs, current events, political affairs, lobbying, public relations, and media relations. 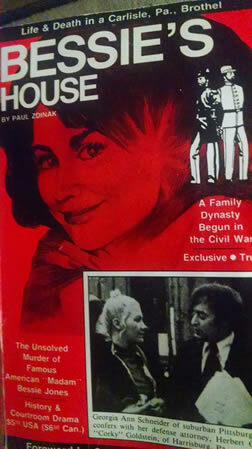 A book was written about one of Corky’s first major homicide defense cases. Formerly Vice-Chairman of the Harrisburg Board of Control which managed the city schools. Has represented many organizations, corporations, and individuals before the legislative and executive branches of Pennsylvania state government and the federal government in Washington, D.C. on lobbying, political and legal matters. Also represents people and groups or companies before local municipalities. Held high-level legal, policy, political and public affairs positions with the federal, state and local governments. Received the American and Pennsylvania Bar Association’s Annual Award for Public Service to the Public. Co-Founded and served as the first Executive Director of Central Pennsylvania Legal Services for the Poor for 4 ½ years, now called Mid-Penn Legal Services, a nonprofit corporation, that still provides free legal services to low income people and groups, in addition to educating young people in our communities about the legal and political systems in Pennsylvania and the United States, Named as one of the Top 10 most effective programs in the United States, when Attorney Goldstein was Executive Director. Corky’s 2 daughters who he loves very much. 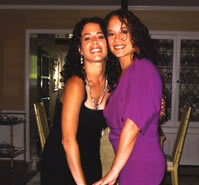 Dr. Lori Goldstein is a New York City psychologist and Stacy Goldstein is the principal at The School of The Future in New York City. Received special national award from the Federal Office of Economic Opportunity, and his legal service project in Pennsylvania was featured in Parade magazine for developing a legal and political education program for middle and high schools in Pennsylvania. This education program served as the model for hundreds of other teaching projects in public schools throughout the United States. Served as Managing Partner of the law firm of Fox, Farr, Goldstein, and Cunningham. 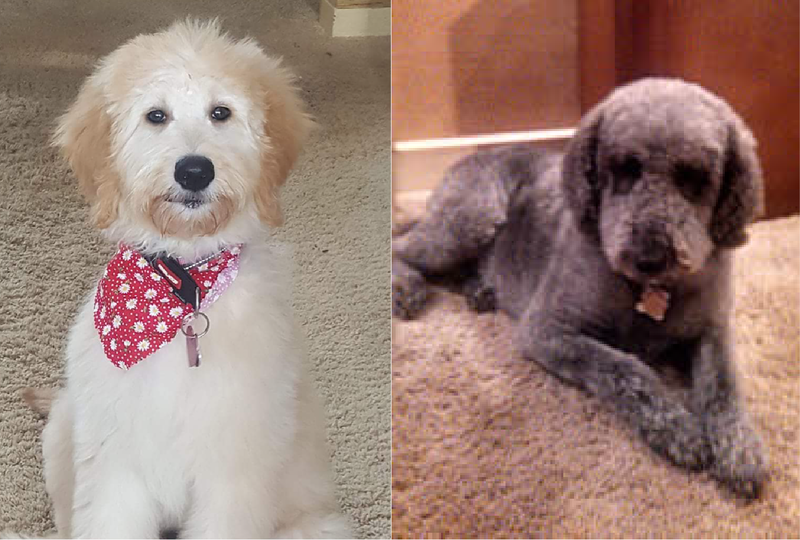 Corky’s Chief Paralegals – Madison and Marley. Deputy Trial Prosecutor in Philadelphia District Attorney’s office handling major cases, including public and private corruption, as well as other major crimes. Named “Man of the Year” by the Capital Area Special Olympics for personal support and involvement in fundraising efforts. Received the “President’s Award for Outstanding Public Service” from the NAACP twice, and other recognitions over the years. Named by the NAACP as one of ten persons who did the most for the Civil Rights movement from 1965 to 2004 in Central Pennsylvania. Respected Radio and TV Commentator on the Legal Meaning and Impact of Laws and Cases, especially legislative law, family law and criminal law in Pennsylvania, also Radio and TV Host and Commentator for all issues, national, state and local. He presently serves as a legal consultant and commentator to WHPTV, CBS affiliate of Harrisburg, PA. Actively involved in numerous civic and charitable organizations in Pennsylvania. 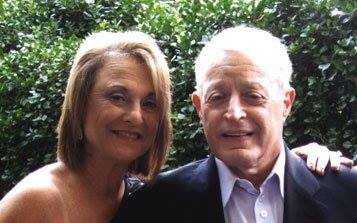 Corky and his wife Linda of 45 years. Linda is an executive at the Harrisburg Regional Chamber & CREDC. He has worked closely as a political/legal adviser to five Governors of Pennsylvania and five Mayors of the city of Harrisburg. He is presently the vice past chairman of the Harrisburg parking authority and is a presently a consultant to the Harrisburg Mayor and the City Solicitor. Initiated the first Big Brother program in Central Pennsylvania and established the Youth Urban Services Program in Pennsylvania for disadvantaged inner-city youth, that raised money to send young people to college. Organized and provided management support to the Hamilton Health Center that still serves the medical and dental needs of low-income inner-city families in both community and school settings in the Harrisburg area. Established first program in Pa. to allow law students (when certified) to handle cases in court 32 years ago. Became a model for Pa. 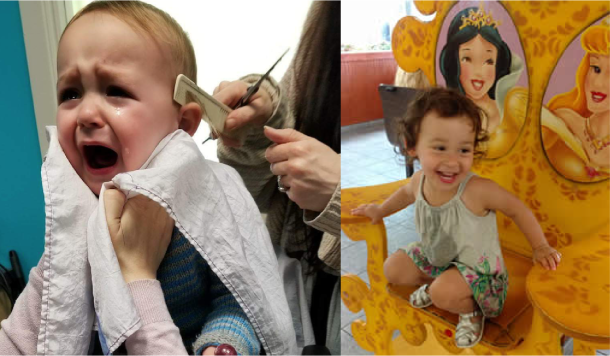 Call Corky Goldstein today at (717) 991-5919 to schedule your appointment.